In the late 1940s, Rolex released a watch called the Cellini. That was the name of the reference – like Datejust or Submariner are used today. Its claim to fame is that it’s considered to be the first certified chronometer produced in large numbers. That watch became the patriarch and namesake of the line of watches begun in 1975, that today carry the Crown logo (where Tudor does has its own logo) and are signed Rolex. The line honors the sculptor and goldsmith Benvenuto Cellini, who lived in Italy during the Renaissance. This line of watches has ebbed and flowed over the years, adding models and taking them away. Newly developed technology has flowed to the Cellini line from the mainstream Rolex line, most notably the movements. Cellini timepieces are definitely and recognizably Rolex, but with much more refined features. If Rolex is the doting father, Cellini is the refined, reserved Ivy League Uncle. Over the years, models have included the Danaos and the Cestello, as well as the fact that the Prince has been brought into the line. The Danaos and the Cestello both suggested a cushion shape. The Cellini Rolex Prince is a classic tank with small seconds. 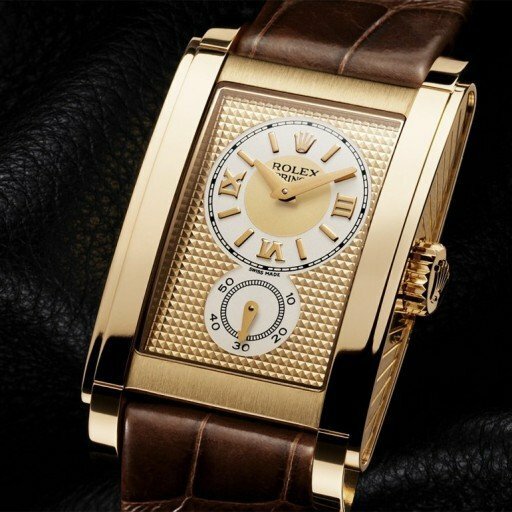 This watch is a direct descendent of the Rolex Prince that debuted in 1928. Possible news from Baselworld next week notwithstanding, their current standard, the Cellini Time and its siblings, the Cellini Date and the Cellini Dual Time have much the look of a Patek Philippe Calatrava, but with a refined coined bezel and crown. Rolex did indeed update the Cellini line, adding diamond bezels to the current line.